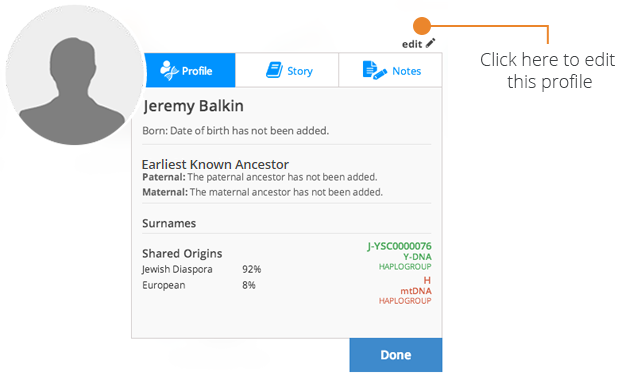 For the first time since the inception of genetic genealogy, you can add your DNA matches to your personal family tree with the myFamilyTree tool from Family Tree DNA. Whether or not you are just starting to build your tree or already have a GEDCOM file uploaded into your kit, this feature is designed to enrich the total genealogical experience. 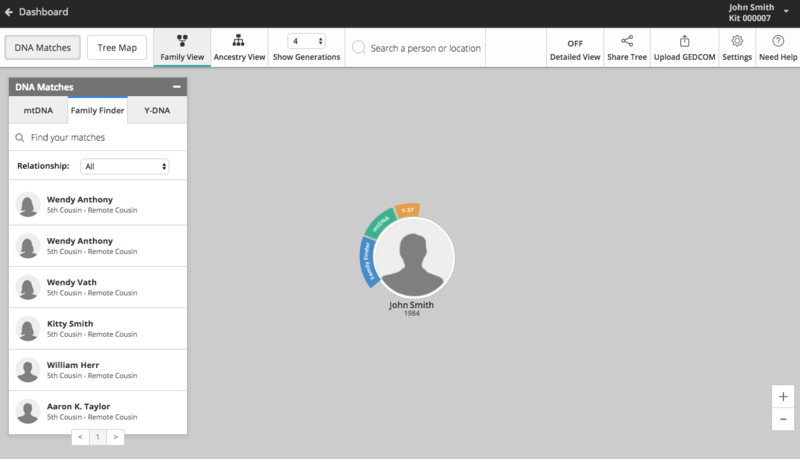 To access the myFamilyTree page, sign in to your myFTDNA account, and click the myFamilyTree button. Learn more about myFamilyTree and Privacy. Once selected, you will be taken to your tree. Below is an example of your myFamilyTree homepage. 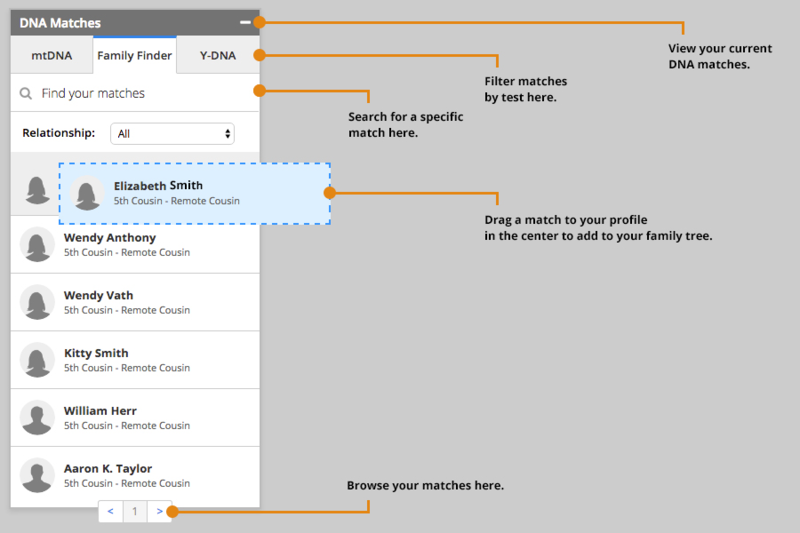 The left side includes a Matches section that will allow you to browse your current DNA matches. You may also include them in your family tree by dragging them to your tree. You may search your tree in the upper-middle of the page. 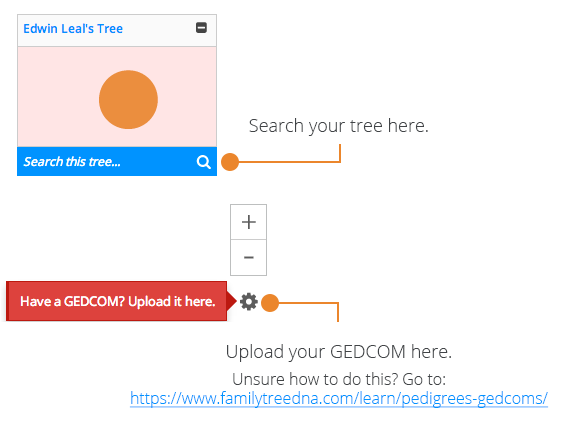 If you have a GEDCOM file and would like to upload it, delete it, or read our Privacy Settings, you may do so from the gear near the upper-right corner of the page. Once you have added family members to your tree, you may view and edit individual profiles to note key information. To edit a person’s information, click on their icon and choose Add Relationship or View Profile. If you select Add Relationship, you will be prompted to assign a relationship to the profile selected. Selecting View Profile will allow you to view information about the individual. This page will include their name, earliest known ancestor, and surnames, as well as their story and notes. To edit a profile further, select the Edit icon near the top-right corner. From here you may edit or add names, birth information, location, surnames, or add stories and notes. Remember to click Save to save your changes or Cancel to discard. What is the “Home Person”? The “home person” is the person that the tree should start with, which is normally you or the person on the kit to which you are adding the tree. How do I add more people to an existing tree? 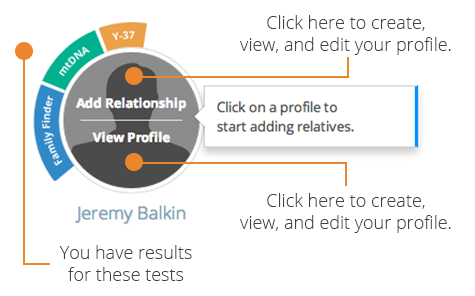 You can add entries to the tree by clicking on your profile circle and clicking Add a Relationship. How do I limit the amount of information on my tree that is shared with matches? | Why can’t I see my match’s tree? The default privacy settings do not allow your matches to view any living relatives on your tree. You can view and edit your privacy settings by clicking on the gearwheel icon at the bottom right corner of the myFamilyTree page. Learn more. Why can’t I delete an entry without losing all the people above them? If you have entries all tied to one person on your tree and no one else, then deleting that person will break the link that connects all of those entries to the tree. When deleting an entry, you will receive a warning message if any additional entries will be deleted with them. Why do some of the people on my tree have a purple paperclip attached to their profile?/ How do I link a match to my tree? The purple paperclip is a link icon that lets you know that one of your matches has a similar name to that entry in your tree. You can click the icon to link your match to the tree if you are certain they are the same person as the entry that was suggested. You can also click on the matches box on the top left hand side of the page and drag your matches name into the entry to which you would like to link them. This will import all of their profile information including their profile picture, earliest known ancestors, haplogroups, ancestral surnames, and birth dates that they have entered. Does the system compare my tree to my match’s tree to come up with link suggestions? No, link suggestions are based on your matches name only. The soundex system will identify matching or similar sounding names between the entries in your tree and your matches’ names and alert you to any possible links to investigate. How do I unlink a match on my tree? To unlink a match, click on view profile and click Unlink. Your matches profile will be unlinked but their name and information will remain. You will have to edit the profile to change it back to the information you had for the entry before linking them. How do I add or change a profile photo to entries on my tree? To add a photo, click on the person, and click View Profile, then click edit and Add Picture. You can drag the photo and zoom in and out to position it correctly. You cannot delete a photo once it has been added; you can only replace it with another photo. What is the difference between Family View and Pedigree View? 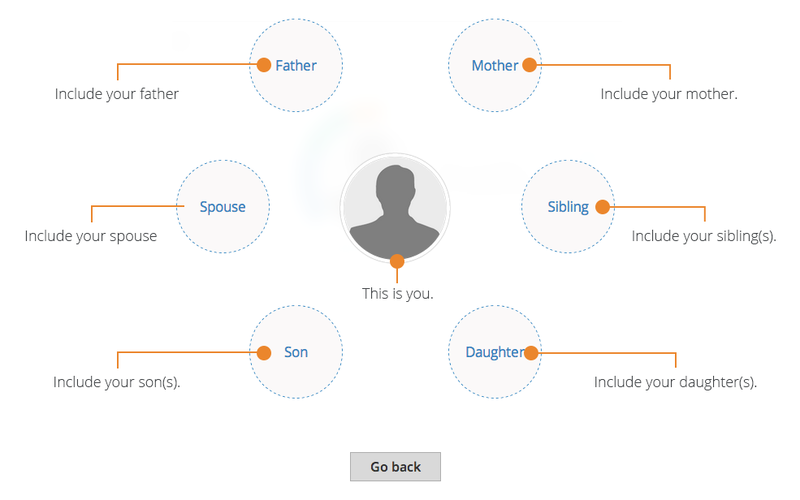 In Family View, the tree will display all of the people you have entered in your tree including siblings, aunts, uncles, and cousins. In Pedigree View, the tree will only display you and your direct ancestors, i.e. your parents, grandparents, great grandparents, etc. in a horizontal layout. You can navigate the tree by clicking and dragging the page, or you can use the small map of the tree at the top right hand side of the page to click on the area you want to view. You can also search for names in the tree by entering them in the blue search box. Why can’t I link my relative’s profile to my tree? You can only link your genetic matches from the tests that you have taken to your tree. If your relative took another type of test, then they are not in your matches list and cannot be linked. What is the public privacy setting for?/ What is the Share this tree link? If you set your tree to public, then you or one of your matches can share the link for other people to view your tree. Learn more. What is Detailed View on myFamilyTree? Enabling Detailed Mode hides pictures and shows full names, birth dates/location, and death dates/location so you have the option to scan the available information more quickly.